The incidence rate of the infected and complex wound is established at approximately 40 000/1 million of the world’s adult population. The aim of this study was to assess the efficiency of three novel types of wound dressings comprising sodium chloride, metatitanic acid and silicon dioxide nanoparticles. The study design was to prove their antimicrobial properties against the microorganisms most commonly causing wound infections. The study evaluated the antimicrobial effect of tested dressings on referenced strains of bacteria (ATCC col­lection, Argenta, Poland) and strains of fungi species (our own collection of fungi cultured from patients). The dressings were tested with both bacterial and fungal strains on solid media (Mueller-Hinton, Sobouraud, bioMerieux, France) in the standard method. The results confirmed the inhibition of growth of bacteria and revealed zones of inhibition for Escherichia coli, Staphylococcus aureus and Enterococcus faecalis. Significant zones of inhibition were established for Staphylococcus aureus and for fungi species of the Candida sp. These results would be crucial due to the fact of the low availability of antifungal therapeutics for both systemic and topical usage. Moreover, the cur­rent standard of antifungal treatment is associated with high costs and high toxicity in general. The preliminary results are very promisingbut further studies are necessary. Based on the obtained results, the tested dressings may contribute to the development of the surgical armamentarium of complex wound management in the near future. The incidence rate of the infected and complex wound is established an approximately 40 000/1 million of adult population (Pelka, 1997). Moreover, a constant increase of this rate is expected, considering the aging population, increased number of civilization diseases, as well as the prolonged survival rate of chronically ill patients. According to recent data approximately 1.5% of the population of developed counties and 3% of the population aged over 60 years will complain of a chronic and complex wound in the near future (Pelka, 1997; Gottrup et al., 2010). Impaired wound healing is commonly associated with the infection of the wound and inadequate treatment, usually based only on empirical antibiotic therapy without any anti­biograms performed previously. Currently, the avail­ability of antibiotics has contributed to their overuse and unreasonable usage in various clinical situations. Antibiotics administered not in accordance with the activity spectrum, reduce the ability of antibiotic tis­sue penetration (Kowalska-Krochmal, 2012). Antibiotics regimen of complex wound therapy is usually used without taking into consideration the appropriate dose and duration of the therapy. It is important to note that antibiotics constitute only one element of the complex approach that should be implemented. Topical antimicrobial agents utilized routinely for complex wounds are frequently ineffective. Thus prompted the research for new methods of dressing augmented with agents with topical antimicrobial action. According to the latest report of the United States Centers for Disease Control National Nosocomial Infections Surveillance System (CDC NNIS), the profile of microorganisms isolated from surgical site infections (SSI) in the recent years has not changed. The most common are: Staphylococcus aureus, coagulase-negative bacteria of the Enterococcus spp. (Enterococcus faeca­lis, Enterococcus faecium), Gram-negative bacteria of the Enterobacteriaceae spp. (Escherichia coli) and non-fermentative rods (Pseudomonas aeruginosa, Acineto­bacter baumannii). Currently there is an increase of multidrug-resistant bacteria causing SSI. On the other hand, Candida spp. (especially Candida albicans) are increasingly recognized as causes of SSI (Sikora and Kozioł-Montewka, 2010). In recent years there has been tremendous progress of research regarding the potential use of nanotechnol­ogy in medicine, especially the application of nanocar­riers as a controlled drug release to facilitate the deliv­ery of therapeutics to the site of action (Moghimi et al., 2005). According to this technology, therapeutics may themselves constitute a nano-scale, and thus can be simultaneously used as a carrier (De Jong and Borm, 2008). Therapeutics in this form have various advan­tages such as high stability and carrying capacity. Both the hydrophilic and hydrophobic agents may be utilized with the availability of various routes of administration (oral, inhalation, etc.) greatly facilitating their use. Ther­apeutics form as nanoparticles may be also designed to be released in a controlled way from enmeshed matrix. All of these properties would contribute to the improve­ment of the bioavailability of the drugs. It is believed that the use of nanoparticles as drug carriers may unde­niably reduce the toxicity of therapeutics (Fadel and Garcia-Bennett, 2010). Silicon dioxide widely exists in the environment, usually in the form of quartz as a component of rocks, sand and minerals. In an active form (SiO2) as a result of its activation reactive oxy­gen species (ROS) may be produced, which can lead to DNA defragmentation and thus to subsequent apopto­sis of the cells. Entering the cells, nanoparticles induce the lysis of the cell structures succeeding in cell death (Chu et al., 2011; 2012). Sodium chloride (NaCl) is a highly hygroscopic property substance. As a component of dressing mate­rials it plays an important role as absorptive particles. Titanium dioxide (H2TiO3) is a substance with varying spectrum of usage. It acts as a catalyst in many chemi­cal reactions. It may be also utilized as an antibacte­rial agent. As a component of various types of filters it may counteract the harmful nitrogen oxides emitted by cars (Bai et al., 2012). Due to its activation induced with ultraviolet (UV) light or hydrogen peroxide (H2O2), the biological activity of titanium oxide significantly increases. This property is considered to improve its antimicrobial activity as a component of wound dress­ing (Bagriche et al., 2012; Charpentier et al., 2012; Zhukova et al., 2012; Roguska et al., 2012). Application of the above mentioned compounds for dressing materials aims to create a composite dress­ing for wound usage, including complex and infected wounds. We hypothesize that a dressing impregnated with suspension of 5% silicon dioxide and 1% metati­tanic acid would increase the antimicrobial capability. Moreover, a dressing composed of 5% silicon dioxide and 5% sodium chloride would possess significantly greater absorption capacity. Thus the dressings would play a crucial role as a comprehensive management assisting complex wound therapy. The aim of this study was to compare the antimicro­bial efficiency of three tested dressings. Radiation was used as an established method for dressing sterilization. The dressings were denoted as number 1, 2 and 3. The study evaluated the antimicrobial effect on bacteria and fungi most commonly causing wound infection. The study used reference strains of bacteria (ATCC collec­tion, Argenta, Poland) and fungi (a collection of our own laboratory). Strains cultured from patients were applied anonymously. As a representative of the Staphylococci family, S. aureus was selected and for the Enterococci family, E. faecalis was designated. As a representative of Gram-negative non-fermenting pathogen, P. aeruginosa was chosen. As representatives of the Enterobacteriaceae family, E. coli, Klebsiella oxytoca, Citrobacter freundii and Proteus mirabilis were selected. As a representative of fungi, five strains of Candida spp. were selected based on patients’ pathogens culture. The study was performed obtaining the acceptance number 186/12 of the Bioethics Committee of the Poznan University of Medical Sciences. The study was only designed as an in vitro phase. This research did not include any studies on animal models, as well as humans. There were no medical and biological inci­dents with the agents, as well as no dangerous condi­tions related to contact with contaminated dressing. The study was performed at the Central Laboratory of Microbiology in H. Swiecicki Hospital of Poznan University of Medical Sciences. Dressing No 1. This was a gas-soaked dressing with 5% suspension of silicon dioxide, A-300. Silicon dioxide was dispersed in an aqueous medium using a high speed blender, as well as the ultrasound tech­nique. Following this fabrication, the excess amount of the medium was removed with a specifically designed device. Dressing No 2. This dressing was impregnated with a medium composing of 5% silicon dioxide and 5% sodium chloride. Sodium chloride particles displayed an osmotic effect, thus intentionally improving the anti­microbial effect. The sodium chloride concentration in the medium was less than usually used in the hyper­tonic solution (9%) due to the fact of the pH range of silicon dioxide in aqueous solution (pH 3.6–4.2). Dressing No 3. This dressing was impregnated with a medium composing of 5% silicon dioxide and 1% metatitanic acid. It needed to be activated with 3% hydrogen peroxide solution before application. Metati­tanic acid accelerated the decomposition of hydrogen peroxide into active OH¯ and O2H¯ ions that effectively decontaminate the wound. The tested dressings constituted a complex novel pattern of dressing material, based on silicon nano­structures. The unique dressings’ composition facili­tated both their bacteriostatic, bactericidal and absorp­tive action. Processing and sterilization of the dressing. All dressings were designed in a round shape with radius 1 cm. They were packed in TYWEK sleeves and were sterilized using radiation. According to the study proto­col, all procedures as well as the storage of the dressings were made using aseptic techniques. The sterility of the dressings was confirmed by microbiological examina­tion prior to the implementation in the study. Antimicrobial activity of all dressings was tested with the referenced strains of pathogens: seven stand­ardized bacterial strains (Argenta, Poland): S. aureus ATCC 29213, E. faecalis ATCC 29212, P. aeruginosaATCC 27853, E. coli ATCC 25922, K. oxytoca ATCC13182, C. freundii ATCC 43864, P. mirabilis ATCC 25933,and five fungal strains from our own laboratory collec­tion cultured from patients (Candida albicans, Candida parapsilosis, Candida glabrata, Candida krusei, Candida famata). All dressings tested for bacterial and fungal strains were verified in microbiological growth medium(Mueller-Hinton, Sobouraud, bioMerieux, France). The study was based on a suspension of 0.5 on the McFar­land scale. This parameter was preferred as commonly used for antibiotic susceptibility testing. Following preparation of the bacterial suspensions, they were placed on the microbiological growth medium of Muel­ler-Hinton agar using a swab moistened with a 3-fold inoculating bacterial culture. For such a prepared sub­strate, dressings were applied aseptically. Dressing No 3 was activated with 5 drops of hydrogen peroxide. Three samples of tested dressings were evaluated for each strain of bacteria and fungi measuring the average size of the zones of inhibition. Dressings applied on well-established growth medium with pathogens were incubated at 37°C for 24 hours. Following this period of incubation zones of inhibition were assessed. Fungi of Candida strains were cultured on Sabouroud agar. Following incubation at 30°C for 24 hours, zones of inhibition were assessed. Because of required prolonged cultivation time for some fungi strains, cultures were extended for a further 24 hours. Disk diffusion method was used in this study. A tissue-paper disc impregnated with the antibiotic was applied on the agar medium with a cultured bacterial strain. The inoculum density of 0.5 McFarland scale was used for the disk diffusion method (Zabicka et al., 2009). Evaluation of the antibacterial activity. A zone of inhibition was observed (measured in mm). Due to the irregular structure of the gauze the dressings were made from, the exact result of zone of inhibition was difficult to assess. To overcome this disadvantage, the average measurement of zone of inhibition was used as the most reliable feature. There was no zone of inhi­bition obtained for both dressings No 1 and 2. This result might indicate the lack of antimicrobial potential against the seven strains of bacteria the dressings were tested with. For dressing No 3 the following zones of inhibition were evaluated (Table I). In addition, some tests were performed with selected strains (E. coli, S. aureus and E. faecalis) at 0.1 McFar­land scale. No zones of inhibition were evaluated for E. coli and E. faecalis. 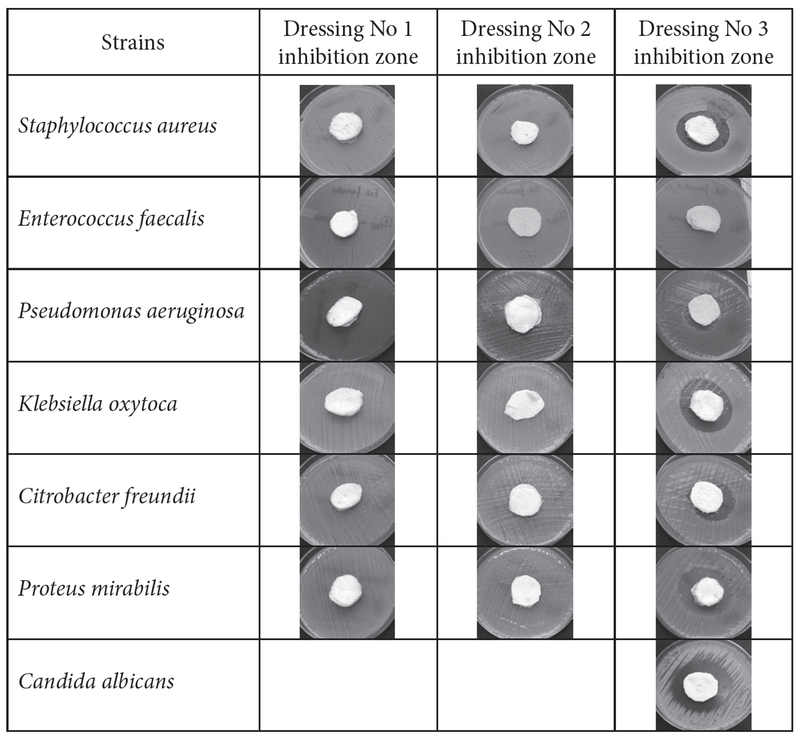 Dressing No 3 inhibition zones for Bacterial strains. Comparable zones of inhibition for S. aureus were assessed for both 0.5 and 0.1 McFarland scale. These results might indicate that the dressing possessed the same antimicrobial potential, regardless of the inocu­lum (density) of the bacteria at the site of infection. Therefore, since hydrogen peroxide is well established antimicrobial substance, an additional test was per­formed to test the zone of inhibition of hydrogen per­oxide alone for E. coli, E. faecalis and S. aureus. It was confirmed in all these three cases, that using hydrogen peroxide alone inhibited the growth of these bacte­rial strains. However, using both hydrogen peroxide with dressing did not inhibit the growth of E. faecalis and E. coli. The antibacterial effects occurred only for S. aureus. According to this experiment, it was estab­lished that using hydrogen peroxide alone did not pre­vent the growth of bacterial strains. Moreover, the anti­microbial effect was confirmed for the dressing No 3 activated with hydrogen peroxide. Evaluation of the antifungal activity. Zones of inhibition were not observed near the applied dress­ings No 1 and 2 for any of the tested strains. This result may indicate the absence of antifungal activity of these types of dressings tested for five species of fungi. The zones of inhibition were perceived for dressing No 3 for all tested fungi species. Following zones of inhibition were revealed near the applied dressing (Table II). Dressing No 3 inhibition zones for Fungal strains. Dressing No 3 was the only one presenting zones of inhibition for all fungi species tested in this study. There was a significant zone of inhibition for tested dressing No 3 suggesting a stronger antifungal effect than the antibacterial one. This outcome seems to be a crucial because of Candida spp. as a common etiological agent of wound infections. Because of the low availability of systemic or topical antifungal therapeutics, high costof therapy, as well as their high toxicity, this would have a substantial impact on current management of com­plex wound (Figure 1). Wounds, both acute and chronic, are susceptible to be infected because of the loss of the inherent ability of the skin to act as a sterile barrier. The lack of the natural skin barrier facilitates easily the migration and coloni­zation of the wound by the pathogens. Microorganisms within the wound form some kind of “biofilm” which is believed to be responsible for the delay in wound healing. It is probably caused by decreasing immune response of the patient and low penetration rate of the antibiotic. Surgical site infection may be caused by varying strains of pathogens. This depends on many factors such as an anatomy region, surgical approach, general condition of the patients, comorbidities and others. The most frequently isolated microorganisms of sur­gical site infection are: S. aureus, coagulase-negative staphylococci, Enterococcus spp., Gram-negative bacilli of the family Enterobacteriaceae (E. coli) or P. aerugi­nosa (Dzierzanowska, 2008; Percival et al., 2012; Kim and Steinberg, 2012; Walter et al., 2012; Schweizer and Herwaldt, 2012). Regular debridement of the wound is considered to be the efficient and preferred management of chronic wounds, especially as a preventive method for patho­gen biofilm development (Davis et al., 2006; Wolcott et al., 2009). Unfortunately, such a procedure seems to be usually insufficient. In the purpose of overcoming this disadvantage, systemically and topically antibiotics, as well as anti­septics and mechanical debridement are used simulta­neously. This kind of management may easily generate multidrug-resistant strains (MDR-multi drug resistant). Based on not fully satisfactory results of many anti­microbial therapeutics used systemically, gradually researchers focus their attention on other methods, including dressings that would act topically. The anti­microbial properties of silver usage have been described for many years, with the well-established high efficiency of the impregnated dressings (Thomas and Mccubbin, 2003; Kostenko et al., 2010). Another method giving great hope in the treatment of complex wounds is nega­tive wound pressure therapy. Remarkable progress in the field of therapy has still some limitations associated with its availability and price. Both chronic and acute wounds are susceptible to be simply infected due to their imbalanced property to maintain a sterile environment secured by intact skin barrier. A complex wound facilitates the develop­ment of new microorganisms within it (Percival and Bowler, 2004; Cooper and Okhira, 2006; Saye, 2007). Thus, there is an usual consequence of being infected with fungi, especially in patients treated with antibiotics for a long period of time. Therefore, it is important to introduce a new model of comprehensive antimicro­bial dressings having both antibacterial and antifun­gal activity. Dressings No 1 and 2 were characterized by lack of antimicrobial activity. Growth of bacteria and fungi rate in the control groups was the same as in the experimental dressing. Dressing No 3 was char­acterized by a strong and specific antibacterial activity and, importantly, antifungal activity as well. The selec­tive action of the tested dressing containing a silicon dioxide, A-300 and metatitanic acid against bacterial strains was related to the diameter of bacterial cells, this seems to be associated with nanostructured silicon dioxide used. This effect mentioned above was observed utilizing H2O2 as a catalyst, resulting in the effect of the active form of metatitanic acid. A silicon dioxide, A-300 nanostructure has an excellent absorption property. This fact would greatly benefit the absorption capacity of the dressing and allows its use in wounds with large amount of exudate. Currently, there is no description in the literature of dressings based on silicon nanostructures (there is only a very promising scientific report using nanostruc­tures in general). The unique properties of silicon nano­structures allow them to be used as redox catalysts, thus enhancing their antimicrobial action. Metatitanic acid TiO(OH)2 is a potent antibacterial agent with a very simple mechanism of activation (contact with hydro­gen peroxide). It has a strong and controlled cytotoxic effect, thus eliminating pathogens without affecting the healing wound process. The presented study is a preliminary report. It is required to use the dressings in further clinical trial studies. Their application seems to be an effective method for the treatment of complex wounds, espe­cially infected ones. The dressings also require the safety evaluation of their usage. All these aspects deter­mine the subsequent steps of trial phases of this type of dressing in the future. Numerous reports have been described regarding the toxic effects of titanium and silicon nanostructures due to increased intracellular ROS levels and DNA damage. Financial support: This study was funded by Mifarmex. The study sponsor had no role in the study design; collection, analysis, or interpretation of data; or in the writing of the report. Baghriche O., S. Rtimi, C. Pulgarin, R. Sanjines and J. Kiwi. 2012. Innovative TiO2/Cu nanosurfaces inactivating bacteria in the min­ute range under low-intensity actinic light. ACS Appl. Mater Inter­faces. 4:5234–5240. Bai H., Z. Liu and D.D. Sun. 2012. Hierarchical nitrogen-doped flowerlike ZnO nanostructure and its multifunctional environmen­tal applications. Chem. Asian J. 7:1772–1780. Charpentier P.A., K. Burgess, L. Wang, R.R. Chowdhury, A.F. Lotus and G. Moula. 2012. Nano-TiO2/polyurethane composites for antibacterial and self-cleaning coatings. Nanotechnology 23:425606. Chu Z., Y. Huang, Q. Tao and Q. Li. 2011. Cellular uptake, evolu­tion, and excretion of silica nanoparticles in human cells. Nanoscale 3:3291–3299. Chu Z., Y. Huang, L. Li, Q. Tao and Q. Li. 2012. Physiological pathway of human cell damage induced by genotoxic crystalline silica nanoparticles. Biomaterials 33:7540–7546. Cooper R. and O. Okhiria. 2006. Biofilms, wound infection and the issue of control. Wounds 2:48–57. Davis S.C., L.Martinez and R. Kirsner. 2006. The diabetic foot: the importance of biofilms and wound bed preparation. Curr. Diab. Rep. 6:439–445. De Jong W.H. and P.J. Borm. 2008. Drug delivery and nanopar­ticles: applications and hazards. Int. J. Nanomed. 3:133–149. Dzierżanowska D. 2008. Hospital Infections edited by Danuta Dzierżanowska (in Polish). Alfa Medica Press Bielsko-Biała, 2nd ed: 298–305. Fadeel B. and A.E. Garcia-Bennett. 2010. Better safe than sorry: Understanding the toxicological properties of inorganic nanopar­ticles manufactured for biomedical applications. Adv. Drug Deliv. Rev. 62:362–374. Gottrup F., J. Apelqvist and P. Price. 2010. European Wound Management Association Patient Outcome Group. Outcomes in controlled and comparative studies on non-healing wounds: rec­ommendations to improve the quality of evidence in wound man­agement. J. Wound Care 19:237–268. Kim P.J. and J.S. Steinberg. 2012. Wound care: biofilm and its impact on the latest treatment modalities for ulcerations of the dia­betic foot. Semin. Vasc. Surg. 25:70–74. Kostenko V., J. Lyczak, K. Turner and R.J. Martinuzzi. 2010. Impact of silver-containing wound dressings on bacterial biofilm viability and susceptibility to antibiotics during prolonged treat­ment. Antimicrob. Agents Chemother. 54:5120–5131. Kowalska-Krochmal B. 2012. Current treatment options for severe infections with antibiotics (in Polish). Forum zakażeń 3: 131–137. Moghimi S.M., A.C. Hunter. and J.C. Murray. 2005. Nanomedi­cine: current status and future prospects. FASEB J. 19:311–330. Pelka R. 1997. The economic situation of chronic wounds. Kran­kenpfl J. 35:338. Percival S.L. and P. Bowler. 2004. Understanding the effects of bacterial communities and biofilms on wound healing. http://www.worldwidewounds.com, 2013.08.06. Percival S.L., K.E. Hill, D.W. Williams, S.J. Hooper, D.W. Thomas and J.W. Costerton. 2012. A review of the scientific evidence for biofilms in wounds. Wound Repair Regen. 20:647–657. Roguska A., M.Pisarek, M. Andrzejczuk, M. Lewandowska, K.J. Kurzydlowski and M. Janik-Czachor. 2012. Surface characterization of Ca-P/Ag/TiO2 nanotube composite layers on Ti intended for biomedical applications. J. Biomed. Mater. Res. A 100:1954–1962. Saye D.E. 2007. Recurring and antimicrobial-resistant infections: considering the potential role of biofilms in clinical practice. Ostomy Wound Manage 53:46–52. Schweizer M.L. and L.A. Herwaldt. 2012. Surgical site infections and their prevention. Curr. Opin. Infect. Dis. 25:378–384. Sikora A. and M. Kozioł-Montewka. 2010. Surgical site infections: clinical and microbiological aspects (In Polish). Wiadomości Lekarskie 3:221–229. Thomas S. and P. Mccubbin. 2003. A comparison of the antimicro­bial effects of four silver-containing dressings on three organisms.J. Wound Care 12: 101–107. Walter C.J., J.C. Dumville, C.A. Sharp and T. Page. 2012. System­atic review and meta-analysis of wound dressings in the prevention of surgical-site infections in surgical wounds healing by primary intention. Br. J. Surg. 99:1185–1194. Wolcott R.D., J.P. Kennedy and S.E. Dowd. 2009. Regular debride­ment is the main tool for maintaining a healthy wound bed in most chronic wounds. J. Wound Care 18:54–56. Zabicka D., W. Hryniewicz, R. Izdebski, M. Gniadkowski and A. Kuch. 2009. Recommended selection of the susceptibility tests for bacteria to antibiotics and chemotherapeutics (in Polish). http://www.korld.edu.pl/spec_rekomendacje.php, 2014.04.03. Zhukova L.V., J. Kiwi and V.V. Nikandrov. 2012. TiO2 nano-particles suppress Escherichia coli cell division in the absence of UV irradiation in acidic conditions. Colloids Surf. B. Biointerfaces 1:240–247.